Onion Tomato Masala, is the base gravy for many Indian dishes,you can make paneer butter masala, mushroom masala ,aloo curry & many more with this one base gravy. When we were in Bangalore, i had a chance to sneak peek into the kitchen of the restaurant where we usually brought the north Indian curries. They had the large vessel of some gravy, so depends on the order, they sauted the veggies and add the already prepared gravy & some spices. That's it ,pipping hot gravy is ready to serve. And even you can see the same procedure in any road side food stalls in India. First peel the onions,garlic & ginger and chop them along with tomato roughly into pieces. Heat the pan with 1 tsp of oil, add the cumin & fennel seed let it fry in oil for 30 secs.Then add the onions, ginger & garlic along with 1/4 tsp of salt and saute till the onions become translucent. Add the cashews and tomato and saute till the tomato becomes mushy. Switch off the flame and let it cool completely. 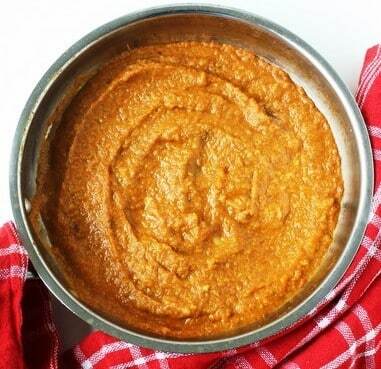 Put the onion & tomato masala into a blender or use an immersion blender and grind them into smooth paste. Heat the pan with remaining oil and add the whole spices(cinnamon, cloves and cardamom),let it fry in oil for 30 secs. Then add the masala paste and spice powder(turmeric, red chili & coriander powder) and salt.If needed add some water and cover the pan with lid and cook for 8-10 mins in medium flame. By the time, the raw smell of the masala is gone,open the lid and keep in low flame until the oil separates on the top. Finally add the garam masala & mix well and switch off the flame.That's it, Basic Onion Tomato masala for indian curry is ready. Adding cashews give creaminess & richness to the gravy. If the tomato has more tart taste, add 1/2 tsp of sugar to balance the gravy. To make the gravy even more richer, add 2 tbsp of cream or Coconut Milk at the end. The color of gravy depends on red chili powder and the tomato, so to get bright red color, always use well ripe tomato & good quality red chili powder.